If you live, work or worship in downtown Durham, you already know there’s a divide. We’re not talking about black and white or good and evil, but of the haves and the haves-not. Those who have a home, have food to eat, and have clothing to put on each morning. And those who have little or nothing. Today’s economic downturn is producing more and more need in our community, for both individuals and for families. And with the school year (and school lunches) ending, families living on the edge face even more pressure to get through each day in the summertime. This resource fair and picnic will provide opportunities to give help to those in need. Opportunities to get help from a variety of service and aid institutions. And opportunities to share a meal, conversation and music with a greater part of your beloved Durham community. Become a part of it. Please join this celebration of community and faith. Volunteers are still needed—contact Rich Ball Damberg at 919.688.4141 or damberg.rich@epa.gov. There are opportunities for all to assist, even if only to welcome a stranger as you share a meal. "Bob Wills Meets Laurie Anderson!" 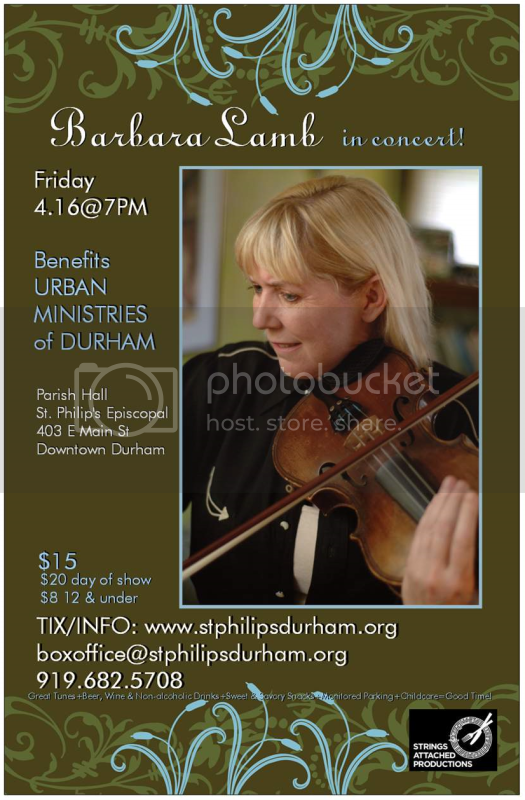 In another stellar Urban Ministries of Durham (UMD) concert benefit, award-winning fiddler Barbara Lamb brings her unforgettable music to the Strings Attached concert series. This "fiddle fatale" will bow your over Friday, April 16, at 7 PM, in the Parish Hall at St. Philip's Episcopal Church, 403 East Main Street, in downtown Durham. As a teen, Seattle native Barbara Lamb won state and regional junior fiddling championships, joined a bluegrass band and gave future celebrity fiddler Mark O'Connor his first lessons on the instrument, as well as his first introduction to bluegrass and Texas swing. In the late'80s she co-founded cowgirl band Ranch Romance. After touring as k.d.lang's opening act for most of a year and recording for Sugar Hill, Barbara left Ranch Romance and moved to Nashville. During the '90s, she released a pair of solo recordings on Sugar Hill, then started her own Lots of Coffee Records. Over her career, Barbara's performed and recorded with Asleep at the Wheel, The John Cowan Band, The Laura Love Band, The Sweethearts of the Rodeo, Lyle Lovett, Riders in the Sky, Peter Rowan, Trisha Yearwood, Tony Trischka—even author Robert Fulghum. When not playing bluegrass and traditional roots fiddle, Barbara experiments with loops and other electronic effects. On the road she lays down background beds, adding whatever moves her, then accompanies the groove with her fiddle and vocals—or not. While built upon solid foundations, the improv nature of Barbara's "audio sculptures" make each performance unique. Tickets are $15 advance, $20 day of show; $8 for 12 and under (advance tickets are available by sending checks payable to Strings Attached c/o St. Philip's Episcopal Church, 403 Main St Durham NC 27701, via phone at 919.682.5708 or through the secure PayPal link at www.stphilipsdurham.org). Younger childcare is available. Refreshments (beer/wine/sodas/water/coffee/etc.) will be available. Free, monitored parking. With leadership from the faith community, Urban Ministries of Durham (UMD) was founded in 1983 with a mission "to provide food, clothing, shelter and supportive services to our neighbors in need." In offering a welcoming, caring, and compassionate environment, UMD aims to affirm the dignity of guests, volunteers, and staff. UMD plays a critical role in the community's continuum of care network, as we are the primary point of entry to prevention, re-housing and emergency services for a large percentage of the homeless and poverty-stricken population in the community. The Community Shelter—regularly operates at full occupancy including the nine rooms for homeless families. Each night, an average of 140-150 people receive emergency housing here. The overall shelter population has increased 32% from the previous fiscal year. The Community Café—serves 3 meals a day every day, about 18,500 meals per month. This number has increased 10% in the past year and 63% from five years ago. The Food Pantry and Clothing Closet—distribute groceries and clothing to adults, children and families. Demand for these services are up 39% from the previous year and 113% from five years ago. Visit www.umdurham.org for more information. Launched in April 2003, Strings Attached Productions is a benefit concert production program of St. Philip's Episcopal Church in downtown Durham. The April 16 Barbara Lamb concert marks the 24th concert in the series. All profits benefit Urban Ministries of Durham. Visit www.stphilipsdurham.org for more information. Strings Attached Productions presents acclaimed Nashville-based singer/songwriter Kate Campbell in a benefit concert for Urban Ministries of Durham, Friday, February 12, at 7 PM, in the Parish Hall of St. Philip's Episcopal Church, 403 E Main St. Durham. The always in-demand artist offers a perfect complement to the mission of UMD and the St. Philip's concert series. Campbell writes smart and sublime; her points are deftly made with reflective reasoning rather than pugnacious preaching. From admiring everyday heroes, marveling at eccentrics, examining human rights, lamenting changing landscapes, summoning spirituality, and reflecting on youthful views, Campbell's memorable melodies and insightful lyrics stay in the psyche, uplifting and inspiring long after the last song. Plus she's a hoot. Be sure to catch this always entertaining talent! Tickets are $15 advance, $20 day of show; $8 for 12 and under (advance tickets are available by sending checks payable to Strings Attached c/o St. Philip's Episcopal Church, 403 Main St Durham NC 27701, via phone at 919.682.5708 or through the PayPal link at www.stphilipsdurham.org). Younger childcare is available. Refreshments (beer/wine/sodas/water/coffee/moonpies/etc.) will be available. Free, monitored parking. The Community Shelter--regularly operates at full occupancy including the nine rooms for homeless families. Each night, an average of 140-150 people receive emergency housing here. The overall shelter population has increased 32% from the previous fiscal year. The Community Café--serves 3 meals a day every day, about 18,500 meals per month. This number has increased 10% in the past year and 63% from five years ago. The Food Pantry and Clothing Closet--distribute groceries and clothing to adults, children and families. Demand for these services are up 39% from the previous year and 113% from five years ago. Launched in April 2003, Strings Attached Productions is a benefit concert production program of St. Philip's Episcopal Church in downtown Durham. The February 12 Kate Campbell concert marks the 23rd concert in the series. All profits benefit Urban Ministries of Durham. Visit www.stphilipsdurham.org for more information. Is it fair when one of today's sharpest songwriters may be best known for his cover of Madonna's Like a Prayer from early on in his career? Fair or not, John Wesley Harding knows a good song, whether he's written it or not. His own best-known song, I'm Wrong About Everything, figured prominently on the High Fidelity soundtrack. The British-born Harding, who took his stage name from another singer/songwriter's song, Bob Dylan's John Wesley Harding, combines witty wordplay with memorable melodies. His songs and his sound easily call to mind fellow countryman and expat, Elvis Costello, but Harding's tunes reveal more whimsical, wry and, at times, ribald wordplay than Costello's. In his first-ever Durham show, and first in the Triangle in seven years, Harding brings his songs to downtown Durham Friday, November 6, at 7 PM, for the next Strings Attached concert. This literate and literary artist performs in the Parish Hall of St. Philip's Episcopal Church, 403 East Main Street (enter on Queen Street). Tickets are $15 in advance ($20 on the day of show), $8 for persons under 12 (under 5 childcare is available on-site). Refreshments (including beer from Triangle Brewing, wine, sodas and water along with sweet and savory snacks) will also be available. All profits from the concert benefit the work of Urban Ministries of Durham. Visit www.stphilipsdurham.org for more information and to purchase advance tickets. After lending credibility to Madge's Prayer, Harding's Sire Records debut, Here Comes the Groom, inspired LA Times' rock critic Robert Hilburn to decree it, "the first great rock record of the '90s." Along with rock's unplugged trend, Harding emerged as one of the first, great anti-folk artists or, as in his words, "folk noir." In 1995 Bruce Springsteen's handpicked Harding as his first opening act in two decades. In addition to Springsteen (who duets with Harding on 2000's Wreck on the Highway), Harding's performed with Lou Reed, Iggy Pop, John Prine, Joan Baez and many more songwriting stalwarts along the way. Now living in the Philadelphia area with his wife and two toddlers, Harding's most recent album, Who Was Changed and Who Was Dead, employs the estimable talents of the Minus Five's Peter Buck, Scott McCaughey and Bill Rieflin, along with Steve Berlin (Los Lobos), Kurt Bloch, Kelly Hogan, Robert Lloyd, Earl Slick (David Bowie and John Lennon) and Mike Viola (Candy Butchers). His songs take on the music biz, religion and his new life of letters as a celebrated novelist. Under his given name, Wesley Stace, he's written two well-received novels so far, 2005's Misfortune and 2007's By George. He's completed another that should be released in the not so distant future. Living, observing, distilling, writing and performing is what John Wesley Harding does. Now, in a rare opportunity, see what he does in an intimate setting in the heart of Durham. Strings Attached Productions presents John Wesley Harding in concert—for one night and one show only—Friday, November 6, at 7 PM, in the Parish Hall of St. Philip's Episcopal Church, 403 East Main Street in Durham (use Queen Street entrance). All profits benefit Urban Ministries of Durham (UMD). Visit www.johnwesleyharding.com for more information and materials about John Wesley Harding. Visit www.umdurham.org for more information about Urban Ministries of Durham and visit www.stphilipsdurham.org for more information about St. Philip's Episcopal Church and Strings Attached Productions. From Carnegie Hall to Car Talk, talented singer/songwriter and expressive tenor Greg Greenway adds stealth, sublime and sometimes in-your-face political awareness to his progressive pop. Greenway brings his powerful, melodic original songs to downtown Durham Friday, October 2, at 7 PM, for the next Strings Attached concert. Join this talented artist in the Parish Hall of St. Philip's Episcopal Church, 403 East Main Street (enter on Queen Street), for an evocative and entertaining evening. Tickets are $15 in advance ($20 on the day of show), $8 for ages 6-12 and childcare for those five and under is available on-site. Refreshments (including beer, wine, sodas and water along with sweet and savory snacks) will also be available. All profits from the concert benefits the work of Urban Ministries of Durham. Visit http://www.stphilipsdurham.org for more information and to purchase advance tickets. The following day, Saturday, October 3, Durham's Eno River Unitarian Universalist Fellowship hosts a social justice workshop entitled "Conversations Toward a Better World," in which Greenway provides musical inspiration for participants. Visit http://www.eruuf.org for more details and registration information. Originally from Richmond, Greenway found Boston, with its rich folk tradition and support of folk musicians, better suited his emerging sound and artistry. Inspired after his father's death in 1990, Greenway left his rock band to pursue a now-storied solo career. Greenway draws inspiration from blues, gospel, jazz, rock and world music, yet at his core resides a tuneful and socially aware singer/songwriter. Described as "one of the strongest, and finest voices in folk music," The Boston Globe noted that he's, "confessional one moment, rambunctiously disarming the next....the songwriter stands squarely between the wistful intimacy of folk-pop and the progressive balladry of Phil Ochs and Woody Guthrie." 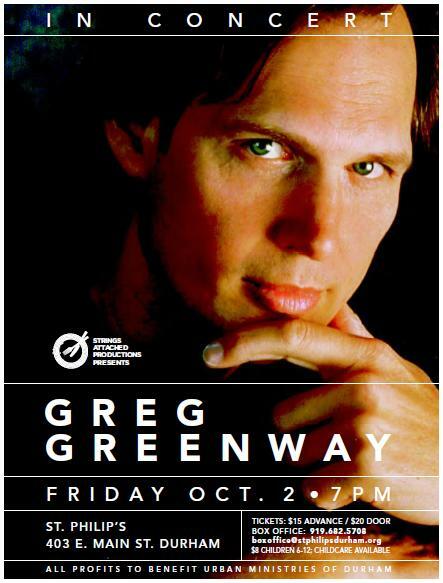 Greenway's performance highlights include shows at Carnegie Hall in the New York Singer/Songwriter Festival, rebroadcast on NPR's World Cafe; an appearance on the nationally syndicated music show Mountain Stage; and a show at the Rock and Roll Hall of Fame honoring Ochs. Greenway also figured prominently on CNN's World Beat in a segment about socially conscious artists and on NPR's Car Talk. He closed a late October 2006 rally at the University of Virginia, featuring NAACP Chair Julian Bond, with his stirring, signature rendition of U2's In the Name of Love. In a recent acousticmusicscene.com interview, Kathy Sands-Boehmer enthused: "Greg Greenway is a positive force of change in this world. His powerful and inspirational lyrics shout out his humanity and soulfulness. It’s impossible not to stop everything you’re doing and listen to him." Visit http://www.greggreenway.com for more information and materials about Greg Greenway. Visit http://www.umdurham.org for more information about Urban Ministries of Durham and visit http://www.stphilipsdurham.org for more information about St. Philip's Episcopal Church and Strings Attached Productions. Acoustic Eidolon may be new to some Triangle music fans. Soon, however, that will change when the Colorado-based husband/wife duo of Joe Scott and Hannah Alkire bring their inventive stringed interplay of original music and surprising covers to Durham, Thursday, May 14, at 7 PM. As the latest in the ongoing Strings Attached series of concerts benefiting the work and services of Urban Ministries of Durham (UMD), Acoustic Eidolon maintains the series' tradition of showcasing the finest in acoustic-based music from national touring acts. Besides guitar, bluegrass-raised Scott plays his own concoction, a double-neck, 14-string "Guit-jo" (looks like a guitar but sounds like guitar, piano, dulcimer, harp and other instruments), and classically-trained Alkire plays cello. Their original compositions and surprising covers ranges from bluegrass to blues, Celtic to classical, folk to Latin, country to classic rock (Beatles Eleanor Rigby, Led Zeppelin's Stairway to Heaven). Their unique blend finds fast fans in every stop. Over the last decade, Acoustic Eidolon has toured vigorously across North America and throughout Europe. The band and its recordings have been featured on public television and radio—including NPR's All Things Considered, John Diliberto's Echoes, Woodsong's Olde Time Radio Hour and numerous radio programs. The pair also performed for the Kennedy Center's acclaimed Millennium Stage concert series, the renowned Kerrville Folk Festival and Vancouver Island MusicFest. Acoustic Eidolon earns praise from critics and passionate accolades from fans. Their live shows include their trademark instrumental pieces along with some vocal selections for extra flavor. performances blend sophisticated playing with infectious energy and humor for an evening of exciting entertainment. Advance tickets are on sale now for $15 ($8 for children 6-12; children 5 and under are free and childcare available). Day of show tickets are $20. Tickets may be purchased online at www.stphilipsdurham.org/stringsattached, by phone at 919-682-5708 or by mail. Checks should be made payable and sent to: Strings Attached Productions PO Box 218 Durham NC 27702. Tickets paid for in advance will be available at the “will call” table at 6:30 PM on the evening of the concert, Thursday, May 14. Call 919-682-5708 for more information. This is a Strings Attached Production; all profits benefit Urban Ministries of Durham. The mission of Urban Ministries of Durham is to provide food, clothing, shelter, and counseling to neighbors in need. Every night, UMD provides emergency shelter for up to 150 persons without homes. Every day it serves 350-400 meals to hungry people. An additional 350-400 persons receive groceries for in-home preparation every month. And UMD’s clothing closet provides clothes to 180-220 each month. Urban Ministries of Durham strives to create a welcoming, caring, and compassionate environment that affirms the dignity of its guests, donors, volunteers, and staff. Visit www.umdurham.org for more information. Confirmed resource providers include Urban Ministries of Durham, Lincoln Community Health Center, Durham County Health Department, Latino Credit Union, Self Help Credit Union, and many other area churches and community organizations. There are opportunities for all to assist, even if only to welcome a stranger as you share a meal.